Indian-American jazz musician Rudresh Mahanthappa’s latest album, Samdhi, begins with an invocation—a saxophone twisting around an electronic drone, an Eastern inflection here, a post-bop line there, a burst of speed, a slowing down to a melodic phrase. In the next track, when a riff explodes on top of a funk rhythm layered with mridangambeats, and Mahanthappa trades jazz solos with guitarist David Gilmore, you know you’ve entered the treasure chest of styles and confluences that marks the sound of one of the fastest rising jazz stars of this decade. Since 2002, the New York-based musician has released 11 albums, working with a wide range of artists, including fellow Indian-American jazz pianist Vijay Iyer, an Indo-Pakistani trio with Pakistani-American guitarist Rez Abbasi and the Dakshina Ensemble with Carnatic maestro Kadri Gopalnath. Though his music today is heavily bent towards exploring his Indian roots through jazz, Mahanthappa spent much of his formative years struggling to escape the ethnic pigeonhole. Mahanthappa was raised in Boulder, Colorado, US, where his parents were teachers. In the 1970s, there were few Indian families in Boulder, and Mahanthappa’s childhood was all-American. He picked up the saxophone at 11, and his first teacher introduced him to a variety of music—progressive rock, big band jazz, Afro-pop—just about anything, as long as it had solid musicianship. Mahanthappa used that eclectic learning to play in a wide range of bands himself—rock, ska, reggae, salsa and even wedding bands. It was only when he went to Berklee College of Music to study jazz performance that the question of ethnic identity popped up. “I began to realize that I was neither white nor black," Mahanthappa says. “However, I did not have a solid template on which to base Indian-American identity. I was often ‘accused’ of being an expert on Indian music by others simply based on the colour of my skin, while the only Indian music I grew up listening to were bhajans. I did want to explore Indian music in greater depth but needed to find a way to do so at my own pace." He got that chance in 1993, when he was part of a student ensemble from Berklee which was sent to India to play at the Jazz Yatra. “On that trip, I had the chance to see concerts by some of the most legendary Indian classical musicians," he says. “One concert in particular (where Parveen Sultana was singing) changed my life. I went to a record store in Bangalore the next day and bought as much music as I could carry." Mahanthappa’s search for his own voice in jazz had begun. It was given a big push by another discovery—Mahanthappa’s brother gifted him a CD which said Saxophone Indian Style as a joke. 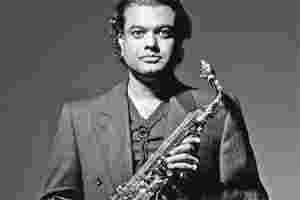 But that album, by Gopalnath, who plays Carnatic music on the saxophone, became a revelation. “This was a big gateway for me as I was able to sit with this album and learn by ear in the same way that I had already been doing with (John) Coltrane," says Mahanthappa, who eventually came to India to work with Gopalnath in 2005, immersing himself in the Carnatic strains. “I wasn’t attempting to master Carnatic music," he explains, “My goal was to compose work that would highlight what we both did. I focus on the building blocks of each art form and see where they compare and contrast." The Gopalnath-Mahanthappa collaboration made its debut in May 2005 in New York to instant acclaim, and in 2008, they distilled their material into the album Kinsmen. Between hearing Gopalnath’s music for the first time and actually working with him, Mahanthappa had spent a decade forging his ethnic identity into his work and honing it into a mature, cogent sound along with Iyer. “We met at the Stanford Jazz Workshop (in 1994)," says Mahanthappa. “Our initial fascination was that neither of us had met another Indian-American jazz musician before and we were chasing similar ideas and concepts." What tied them together was also the fact that both of them were circumspect about using Indian influences in jazz, partly because of their lack of knowledge about Indian classical music, and partly because the East-West blending in jazz had been happening since the 1960s already. Record labels and the music industry were eager to market their “Indianness" (“why don’t you do an album with Ravi Shankar?" was a common refrain). Instead, Mahanthappa and Iyer went on with their own projects, using Indian elements in their music carefully, producing albums that have been critical successes. Mahanthappa is currently touring Europe to promote Samdhi, but he is still on the lookout for innovation. “Everyone I look up to in music is always searching for something new," he says. “I hope that my work continues in the tradition of jazz as an exploratory art form that engages with and speaks to contemporary culture."